A word processor of sorts. Allows styled text. embed videos, bulleted lists, special characters, tables, and much more. Hyperlink to pages on the site, any URL, locker resources, or create a mailto link. Insert images from computer, locker, or image album. Include any or all registered users from your site in a directory that includes name, phone number, extension, and position. User names link to their personal site, if it is published. Envelope icons allow public visitors to send an email message to anyone listed in a directory (admins have the ability to turn off the public contact form). MP4, MOV, WMV, SWF, and FLV files are currently supported. Customizable title, width and height. Note: By default, this element is not enabled. Request must be made by administrator to enable video element. Use this element if you wish to include the Login and Register buttons on the homepage. Each section has its own locker. Upload files and links to the locker and make them available for download. 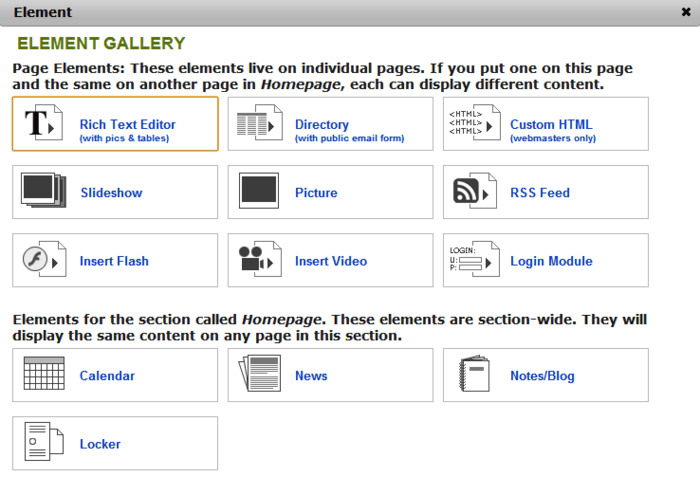 Since it is possible to set any locker element to display the contents of any locker on the site or any folder within a locker, organizing resources into folders is recommended.